Wikipedia is one of the most visited reference sources in the world, yet relatively few people edit or create content for it. Let's change that! 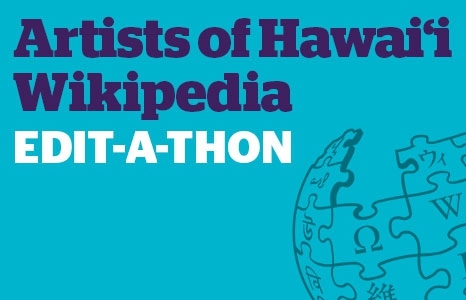 Join the Honolulu Museum of Art and UH-West O‘ahu's James & Abigail Campbell Library for a half-day edit-a-thon where we’ll work to increase the visibility of Hawai‘i artists on Wikipedia. No prior Wikipedia editing experience is necessary. Computers, training, reference material, and light refreshments will be provided. Admission: Free, however, space is very limited. RSVP required by email: archives@honolulumuseum.org. If you are already familiar with Wikipedia editing you are welcome to participate remotely by signing up online here. This program is sponsored in part by a grant from the Hawai‘i Council for the Humanities.